About the Book: As the May 1864 Overland Campaign shifted from the Wilderness toward Spotsylvania Court House, Confederate commander Robert E. Lee successfully bottlenecked the Federal army just outside the village. Undeterred, Union commander Ulysses S. Grant sent part of his forces on a wide flanking maneuver to attack Confederates from east. Lee scrambled to block them. Thus the Civil War came to the property now known as Stevenson Ridge. 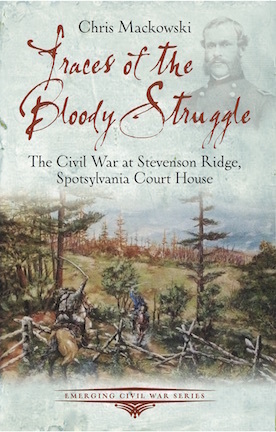 Traces of the Bloody Struggle: The Civil War at Stevenson Ridge, Spotsylvania Court House tells the story of Spotsylvania’s forgotten front: the fighting along the Fredericksburg Road. During the two-week battle, three-fourths of he Union army occupied and crossed over Stevenson Ridge as Grant looked for ways to break Lee’s defenses. Today, Stevenson Ridge is one of the most historic properties in Spotsylvania County. Extensive earthworks crisscross the landscape. Stories abound. Traces of the struggle remain everywhere. Chris Mackowski, Ph.D, is the historian-in-residence at Stevenson Ridge. He is a writing professor at St. Boneventure University and editor-in-chief and co-founder of Emerging Civil War. I ordered this book on Amazon before Christmas and the delivery date keeps getting pushed back… January, then March, now May. Does anyone know what’s going on with the release of the book? We apologize for the delays, but hopefully the wait will be worth it. As Meg was working on the book, she kept digging up great stories, so we gave her the green light to expand the book a little in order to accommodate. We think readers will be pleased with what she came up with! The book is now in production, so look for it later this spring for sure! Any update on this book… ordered it awhile ago and to be honest, if it isn’t coming out soon (like in the next month) that money would be better allocated somewhere else. Grisly to say the least!